Enjoy the refreshing taste of Doublemint gum – the unique, minty flavor you can’t get anywhere else. Doublemint was launched in the U.S. in 1914 and has since become one of the world’s best-selling chewing gums, enjoyed by generations of consumers worldwide. Today, the classic Doublemint flavor lasts longer than ever. 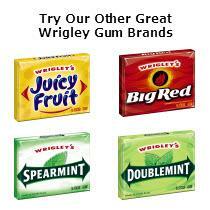 Doublemint is one of the largest selling gum brands in the world, available in over 140 countries. Wrigley is a recognized leader in confections with a wide range of product offerings including gum, mints, hard and chewy candies, and lollipops. Wrigley’s world-famous brands – including Extra, Orbit, Doublemint, and 5 chewing gums, as well as confectionery brands Skittles, Starburst, Altoids and Life Savers – create simple pleasures for consumers every day.